Armenia's New Leader Visits Disputed Nagorno-Karabakh Region - Integration Through Media ....! 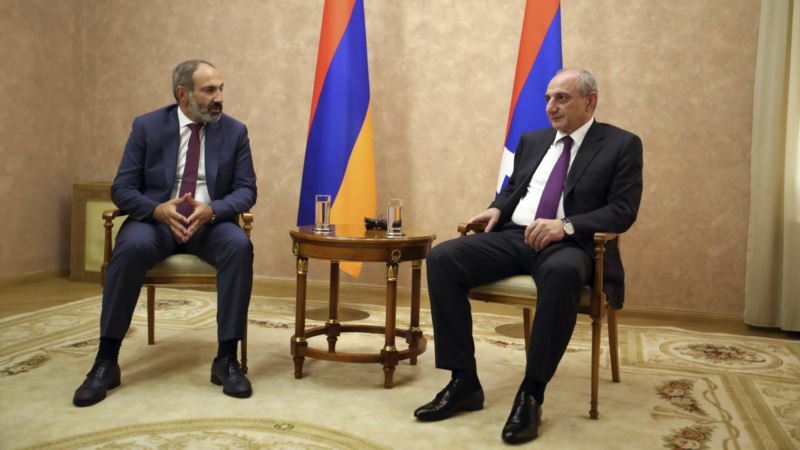 (VOA): Armenia's new prime minister marked his first full day in office Wednesday by visiting the disputed territory of Nagorno-Karabakh, pledging to maintain security guarantees for a region that's part of rival Azerbaijan. The trip was also a provocative move toward Azerbaijan. Pashinian “seems to prefer political agitation instead of being engaged in addressing the daunting social-economic problems of Armenia and the Armenian people,” Azerbaijan Foreign Ministry spokesman Hikmat Hajiyev said. “In order to disguise its direct responsibility for military aggression against Azerbaijan, Armenia distorts and misinterprets the principle of the people's right to self-determination” Hajiyev said. Pashinian reasserted Armenia's commitment to Nagorno-Karabakh, a part of neighboring Azerbaijan that ethnic Armenian forces have controlled since a separatist war ended in 1994. Pashinian called for continued negotiations to end the conflict, but accused Azerbaijan of ratcheting up tensions. He said the self-declared government in Nagorno-Karabakh should be included in talks. “How can this negotiation format solve an issue when one of its key participants is missing from the negotiation table? This is not an issue to be approached with emotion but rather with pragmatism,” he said. He expressed hope for “new momentum” in relations between Armenia and Nagorno-Karabakh. The territory's de facto leader, Bako Sahakyan, welcomed Pashinian's visit and assurances for continued defense of the region. Shooting frequently breaks out across a demilitarized zone that separates ethnic Armenian forces and Azerbaijan's soldiers. The region's unresolved status contributes to the economic problems that are a key issue for Pashinian's supporters. Both Azerbaijan and Turkey have closed their borders with Armenia over the conflict, inhibiting trade and leaving Armenia in semi-isolation. Pashinian's election capped weeks of political turmoil that had raised concerns about stability in the Caucasus Mountains region. He has yet to articulate a platform and faces an array of challenges, including the Nagorno-Karabakh conflict and a parliament dominated by the party he denounced as corrupt.